Located on Co Giang Street - Dalat City, just minutes from Ho Xuan Huong Street and the city center, Villa Nhỏ Xinh is the homestay you cannot miss when coming to Da Lat flower city. If you want to relax and enjoy the Dalat pace of living in a very special way, this place is for you. All you need is a backpack and everything else is well prepared for you at Villa Nho Xinh, from small pillows to the fully equipped kitchen. Your experience here will be much different from staying in the hotel or motel because this small Villa brings cozy feelings as your home. In addition, you can ask us for advice about traveling in Dalat. We hope you have a wonderful time staying in this Villa. 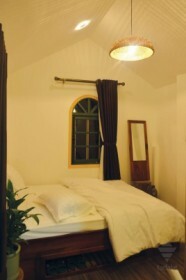 The villa has 8 bedrooms, each is decorated in different style. However, they have the same color tone of white and wooden. The living room and kitchen area are accented by innovative interior details, such as a unique dining table and ceiling lights that you can not find anywhere else but The Small Villa. Moreover, the spacious garden area in front of the villa is suitable for holding cheerful BBQ parties or sitting around the campfire, having hot tea and enjoying fresh air at Da Lat sweet nights. - Around the villa, there are many beautiful cafes and specialty restaurants in Dalat . - Famous tourist destinations that you should visit: Xuan Huong Lake, Giant Pumpkin Garden, Lam Vien Square, Love Valley, Dalat Milk Farm, Romantic Flower Garden, Dalat Train Station.